PSN Co-Op Sale now live, stacking deals, and more to come? But wait, there's more! Spend $100 between now and Dec 2nd and get a $15 voucher for a future purchase. Is there even more than that?? Well, the blog post announcing the sale includes this tidbit: "including any Black Friday deals that may or may not be coming your way *wink, wink" so there should be more deals at the end of the week. SO the strategy is pretty simple. 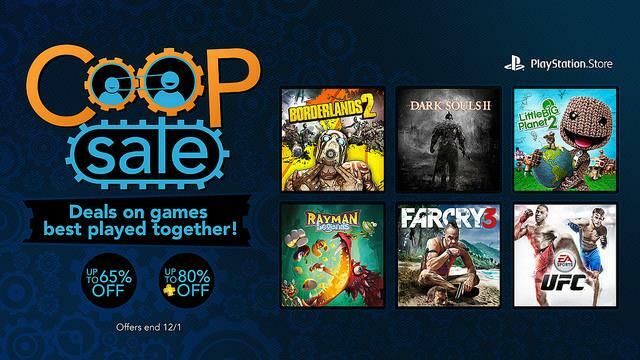 This Co-Op sale runs through next Monday, the 10% is a one-time code. So wait two days, keep these deals in mind, and when the Black Friday deals go live spend in excess of $110, on already heavily discounted games, use the one-time code to stack an additional 10% off and bank the $15 for next time. Sweet. You can check out the Co-Op sale blog post on the Playstation Blog, or head over the the Playstation Store and browse the deals.